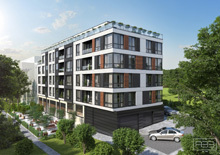 “Buy in Bulgaria” is offering an excellent plot in Varna, in the area of Cabacum. The plot has an area of 1245 sq.m and has 15 m border with an asphalt road. It received building permission, has water and electricity and sea view. The location is quiet and calm, very suitable for rest and relaxation. The beach is only a couple of minutes walk away.